I'm quilting again. Got my mystery quilt fixed. 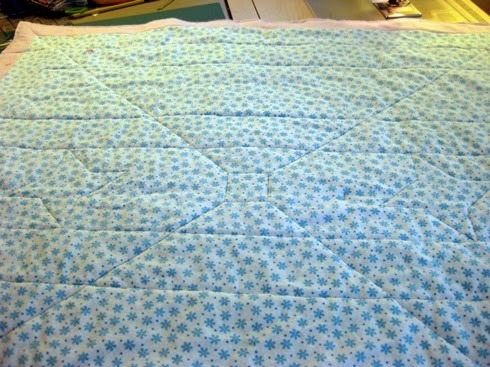 While I did assemble this using QAYG and row by row - I didn't quilt a lot of it because, surprise! 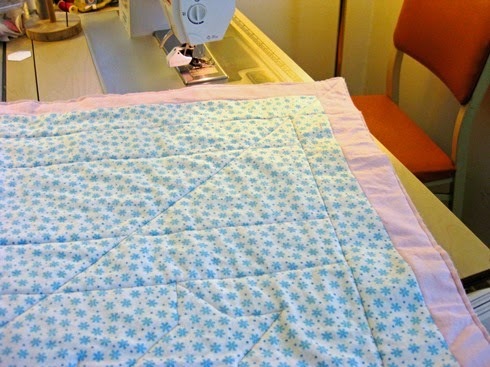 - I can now more easily quilt a 42" top. I'm making progress! Because this had so many strong diagonal lines, I decided to quilt it on those lines. The top picture shows my first line - a diagonal from corner to corner. I call this eyeing the line because I'm not going to mark the lines with Frixon pen or chalk lines. I'm going to eye the line ahead of the needle to the next small block. Even though I'm using my walking foot, I'm guiding it, so to me it's sort of like free motion. I wouldn't have been able to do this if I hadn't watched Leah's video on straight line (or SITD) quilting. To me that is still harder than stippling or a meander. Hope you got a chance to quilt today! I'm linking to Leah's Free Motion Project on Friday and Sarah's Can I get a Whoop Whoop. Congrats, Leah, on your finish, and to Sarah for getting her longarm back running. Personally, I frequently piece my back with "borders" or a center vertical or horizontal panel. Sometimes I toss in left over blocks, whatever is needed so that the back extends a few inches beyond the top. Necessity has made for some simple but creative backs. Congratulations for finding a solution to your creative opportunity. Great Save Angie and nice quilt all the way around. great thinking on the back. I love that mystery quilt, definitely a cuddlely quilt that for sure. Good solution to the backing shrinking. 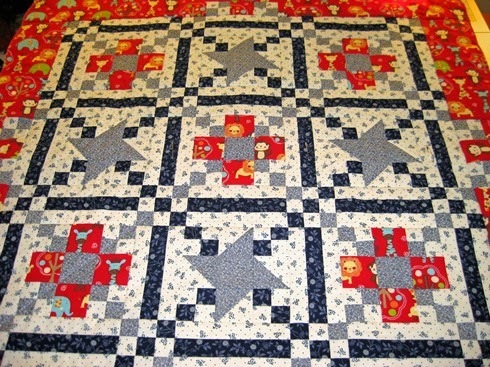 I like both sides, and the quilting looks great. Maybe I should watch that video, since I didn't do so well last time. Or maybe I should just practice more often! Thanks sharing at tuesday archives! !